Jointly-sponsored by Rhode Island State Council for the Arts (RISCA) and the Rhode Island Foundation (RIF), this pilot program is designed to build capacity among Rhode Island arts and cultural organizations around diversity, equity, and inclusion. Consisting of a three-part workshop series and technical assistance package, organizations will obtain the knowledge, tools, and strategies needed to attract and retain an engaged group of staff, volunteers, and board members through shared learning and individualized consultations with a field expert. Potential applicants are highly encouraged to speak with Todd Trebour, RISCA’s Organizations Program Director, at 401-222-3882 or todd.trebour@arts.ri.gov prior to application. A PDF version of the program guidelines is available here. Provide participating organizations with material that represents best practices in diversity, equity and inclusion (DEI) designed to assist each organization match their commitment to DEI with that of their stakeholders, audiences and cultural/service offerings. Offer the cohort individualized assistance with creation of a plan for full implementation of equity and diversity practices and action steps. Cohort: consists of 8-10 organizations selected via application. Organizations must complete a written application. Participants: Up to three representatives from an organization must attend all sessions, including Executive Director (ED) and Board Chair. 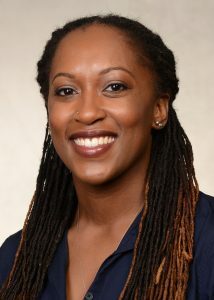 Presenter and Technical Assistance Provider: Brea Heidelberg, Ph.D., assistant professor at Drexel University (see bio below). Program elements: Workshops (3 hours each): each workshop will run from 9 AM – 12 PM on the date specified at RIF. Workshops will be followed by a networking lunch courtesy of RIF. Friday, June 21, 2019 – Nuts and bolts of diversity, equity, and inclusion work: an overview. Friday, August 30, 2019 – Advancing diversity, equity and inclusion within your staff and volunteers. Friday, September 27, 2019 – Advancing diversity, equity, and inclusion within your governing body. Upon completion of the workshops, participating organizations will be eligible for participation grants up to $1000 from the RI Foundation. Individual technical assistance: up to 3 hours of individual phone, video conference and/or in-person coaching for ED and/or board chair after workshop series is completed, depending on org needs. Participating organizations will receive grants from RISCA to cover the cost of the 3 hours of technical assistance. Peer-to-peer check in session 6, 9, and 12 months after first workshop to maintain accountability. Program outcome (short-term): clearly defined staff and board diversity and equity development plan. Program outcome (long-term): implementation of staff and board diversity and equity development plan. We understand implementation may only be initiated during program time table. Be a 501(c)(3) non-profit organization registered in the state of Rhode Island. Have arts and culture as central to the work of the organization. Have an annual budget under 1.5 million. Demonstrate a commitment to diversity, equity, and inclusion at the board and executive staff level. Illustrate an understanding of diversity, equity, and inclusion. Be ready to take the steps to implement change within 6-12 months. Demonstrate a past history of diversity, equity, and inclusion efforts at the organization. Because this is a pilot program, the cohort will be kept small and – in as much as possible – focus on a group of organizations who share similar attributes, including level of commitment, budget size, programming, and communities served. Participation and performance in this program will have no impact on future or current funding from either RISCA or the RI Foundation. As pilot program participants, you will be helping RIF, RISCA, and Dr. Brea Heidelberg in developing this model of cohort-based DEI learning for organizations of small-to-mid sized budgets. Participants will be asked to complete surveys and respond to interview questions about their experiences. Participation in these assessments is voluntary and may stop at any time without forfeiting the right to continue in the cohort. All responses will be kept confidential and will be used to improve cohort structure, materials, and provide the arts and cultural field with insights into how to work toward field-wide equity. Application deadline is April 15. Notification of acceptance into program will be by May 3. Application will consist of a brief narrative and supplemental materials (see below). Application can be completed online via RISCA’s grant portal for organizations here. Existence of trainings for staff and board on DEI. Degree to which board and staff reflect communities served. Processes for engaging staff in discussions around differences, and ensuring safety of staff in discussions. Existence of written policies that relate to DEI (e.g. cultural equity statements, policy for reporting discrimination). Existence of self-reflection and assessment by staff and board on organization’s DEI efforts. Degree to which communities served and staff are allowed input into decision-making. Picture your organization 5-10 years from now. What are 2-3 things would be different from a DEI perspective? What do you think you need to accomplish them? Board and staff list with * indicating Asian/Asian-American, Hispanic/Latinx, Black/African-American, Middle Eastern/North African, Pacific Islander, and Native American individuals. Brief, signed letters of support from ED and Board Chair indicating their interest in the program and commitment to attend the workshops. Brea is an arts management consultant, educator, and researcher. She is currently an Assistant Professor and Associate Program Director for the undergraduate Entertainment & Arts Management Program at Drexel University. Brea serves on the Emerging Leaders Council for Americans for the Arts and on the editorial board of the American Journal of Arts Management. She is also a Board Member of the Association of Arts Administration Educators, currently serving as Vice President and the chair of the Diversity, Equity, and Inclusion task force. Brea’s research and consulting work centers on diversity, equity, and inclusion throughout the arts management ecosystem, professional development issues facing arts administrators, and human resource management in arts and cultural organizations. She has a varied background that includes experiences as a dancer and choreographer as well as positions in community engagement and programming at both visual and performing arts organizations. Brea has completed specialized training in evaluation at Claremont Graduate School. She also earned her master’s in Human Resource Development from Villanova University and her doctorate in Arts Administration, Education, and Policy from The Ohio State University. 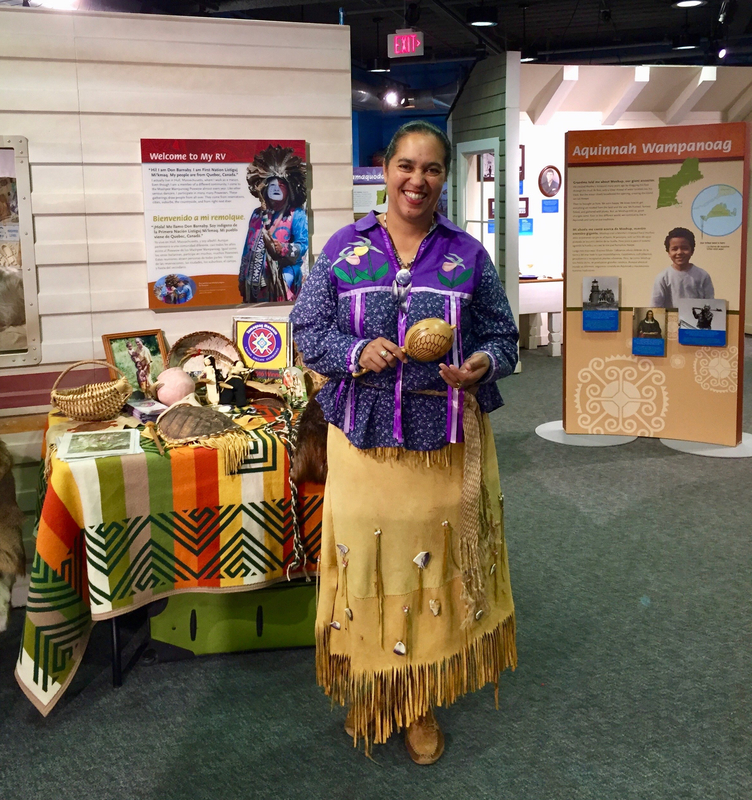 Lorén M. Spears, Narragansett, Executive Director of Tomaquag Museum, holds a Masters in Education and has received numerous awards, including a Doctor of Humane Letters, honoris causa, from the University of Rhode Island for her work. She is an author, traditional artist and shares her cultural knowledge with the public through museum programs. She is also a council member of the Rhode Island State Council on the Arts. RISCA: Give us a brief overview of your day yesterday- what did you do in both your personal and professional life. LS: Yesterday I went to Providence as I serve on the MET School Board for an 8am meeting then went to the Secretary of State’s Office for the RI Historical Records Advisory Board (newly appointed by Governor Raimondo) for that meeting. After that meeting I stopped into an unique vintage shop and bought my nephew a gift to go with his traditional regalia, it was this amazing mink stole! He is an MET high school intern at Tomaquag and is focused on education and fashion design. He designed his last two grass dance outfits. Back in the office, I met with staff about various projects from collections, archives, education, retail and the Indigenous Empowerment Network. I spent quite a bit of time responding to emails, following up on partnerships, and preparing for grant writing & reports. 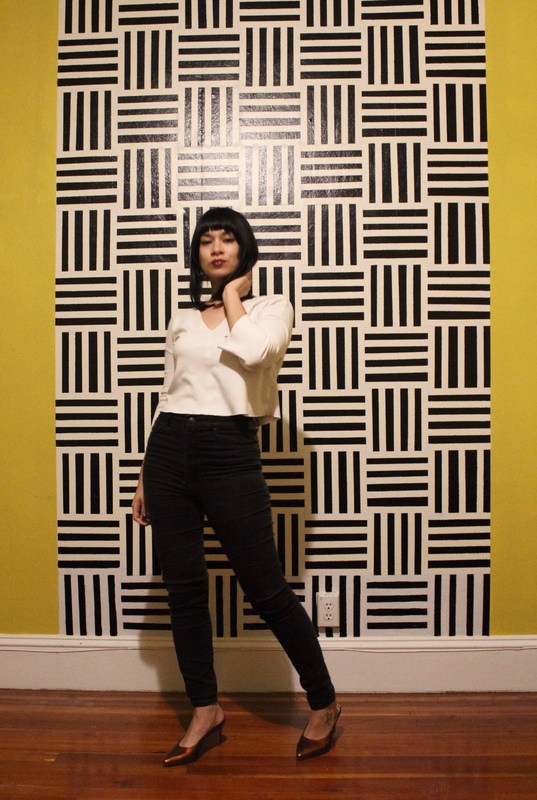 RISCA: What do you love about the art community/scene in Rhode Island? cultural educator, college student and Millennial, holding a photograph of Princess Red Wing, Narragansett- Wampanoag Sachem, Educator and Culture Bearer. There are so many partnerships to mention but we are proud to be a partner with RISCA since its first Eastern Woodland Native American Art Show. Each year, the show becomes even more vibrant. We are partnered right now with the University of Rhode Island’s Fine Arts Gallery for the show, Yo Nuweekun; We Dwell Here. It continues until March 1st. We have worked with many organizations to bring Indigenous arts into visibility within our homelands. Check out the painted cairn in Roger Williams National Memorial Park, painted by Tomaquag Narragansett Interns Robin Spears III & Lynsea Montanari. We partner annually with the Rhythm & Roots Festival in Charlestown, RI over Labor Day weekend. It includes an Narragansett elder Dawn Dove, providing the opening welcome & blessing; Native Artist collaborative vendor tent; free daily art workshops; storyteller Thawn Harris in Family tent; and last year The Groovolottos, a funk R&B band, performed in the Roots Tent. Through all of these artist partnerships, we want Rhode Islanders & Tourists alike to know “We Are Still Here” and to learn about our history, culture and contemporary lives through the arts. RISCA: Why do you make Rhode Island your home, and how did you end up here? LS: It is my Homeland, as a Narragansett. We are the First Peoples of this place. Our ancestors are here. However, I was born in Spokane, Washington, as my father was in the Air Force. We moved back home when I was two. I have no memory of our time there. This is my home. RISCA: What is one thing you think the art community in Rhode Island needs? LS: Visibility for the smaller yet impactful community arts organizations, they make Rhode Island vibrant, serve their community, and impact Rhode Island through tourism, economic investment and quality of life. RISCA: What Rhode Island artists and/or arts organizations most inspire you and why? LS: There are so many wonderful and impactful RI artists and arts organizations that I struggle to narrow it down but I will name a few. Holly Ewald, UPPArts for her ability to use art for environmental change and creating a coalition of folks to join her from all walks of life. Valerie Tutson, RIBS, for bringing untold history to life through storytelling. 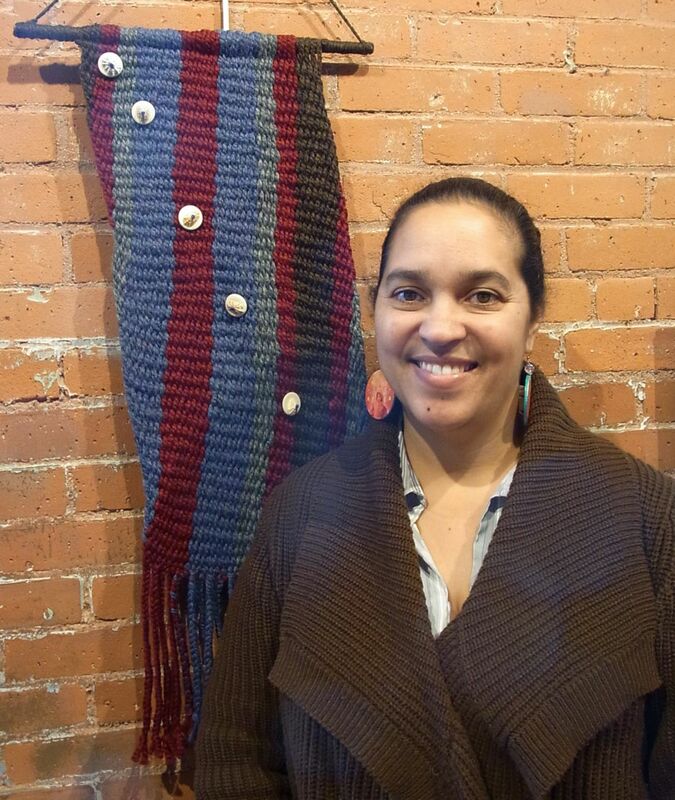 Dawn Spears, NIAA & Narragansett Food Sovereignty Initiative, for supporting New England Native artists’ development via NEFA, her own artwork, design work, arts leadership and integrating arts into all her advocacy. Nancy Brown Garcia, Narragansett, for the world record for smallest beadwork. Allen Hazard, for his wampum art, willingness to mentor other artists and share his story with the world. My husband, Robin Spears, Jr. for expressing our history, culture, ecological knowledge through his art, for inspiring others, and for passing his gifts to our children, all traditional artists. For the late, Ella Seketau, along with Alberta Wilcox and the late Diosa Summers, who at various times taught me to Fingerweave and twine. I am forever grateful, as it is an artform, I love and am blessed to share with others. To all my tribal elders, family, and especially my mother, Dawn Dove, who shared their cultural, arts knowledge with me and empowered me to share it with my family and community. Kutaputush! Thank you! Kameko Branchaud is an artist and educator from many places, but mostly Providence, Rhode Island. 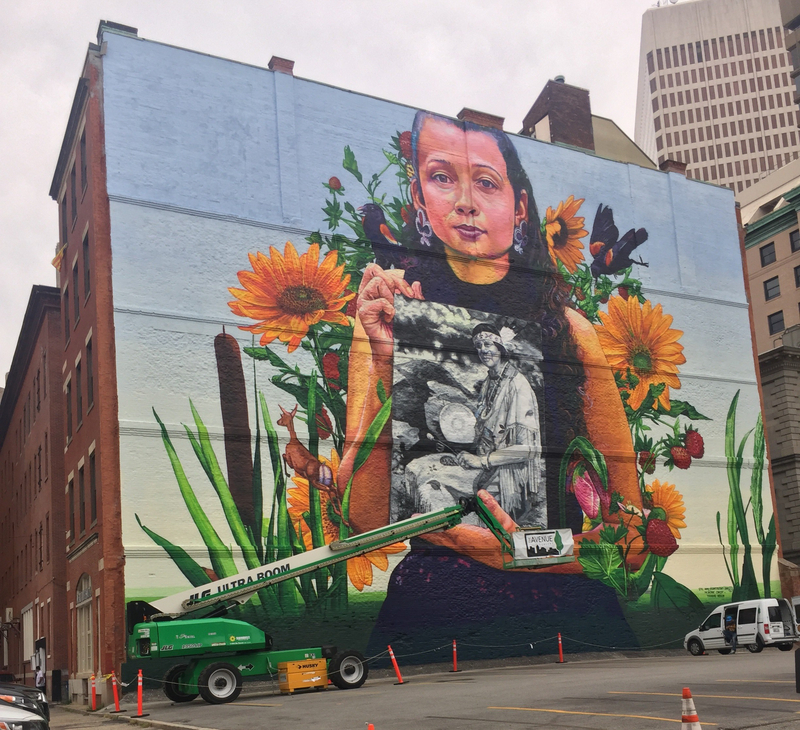 She was brought on board as the new Director of Education at Newport Art Museum in summer of 2018, and her murals can be found in Providence, Salem, Hanover, and Miami. We asked her a few questions about her life and art-making in Rhode Island for our series, Rhode Island Cultural Anchors. KB: I’ve lived in five states and Guam, and I’ve always found Providence the easiest place to feel at home. The art scene, the state’s richness in diversity, and the sense of community that is hard to find in larger cities have all enticed me to move back three times. As an artist, I immediately feel like I belong when I’m surrounded by other artists. As a cultural producer, I feel that the small scale of Rhode Island, combined with its saturation of talent, makes it an ideal place to make things happen. RISCA: What are you the most excited about right now in your work as an arts and culture administrator? KB: I’m excited to be in a leadership position in which I can build inclusive, relevant programming that provides whatever it is that our local artists need, and I’m excited to infuse our programs with public art components. We’re in the process of re-launching our monthly Saturday program for kids, our museum career prep program for high-schoolers, summer camps, new workshops and classes through our School, and there’s more in the works. This spring we will be renovating some of our spaces for the Museum’s first-ever artist-in-residence program. I’m excited to see what our programs will look like in six months, and in two years. RISCA: Why do you do what you do? What inspires you, drives you, to create or enable the creation of art? KB: Being an artist was never my choice; the arts chose me. I was pricing my drawings as young as age 4, and I think I was 6 when I wrote my first pricing structure for art lessons. Making art is how I process the world. Even if that doesn’t come naturally to someone, I believe there is intrinsic value of processing information, feelings, events, and responses through the arts. I want everyone who can benefit from doing that to have access to the arts and to be empowered by them. KB: Across the board, art institutions need to become more inclusive. This is a major issue for museums throughout the country as huge segments of our changing population are not reflected in our museums. Being a person of color working in museums, often with students of color, I see and feel issues of representation at every level — who’s working in museums, whose artwork is on display, how people of color are represented when they’re the subjects of artwork, and how it feels to be a person of color visiting a museum. What the art community needs is for the gatekeepers — museum workers, gallerists, event organizers, program coordinators, funders — to move beyond dialogue and actively work towards building racial equity at every level of our local arts institutions. Define your communities, train your staff on what diversity is and is not, identify barriers to participation, to start. I know that Newport Art Museum and other arts organizations in the state are working towards equity and inclusion, but I’d love to see collaborative efforts along the way. I want to see organizations sharing their tactics and successes so we can elevate our practices statewide, until every person knows they are welcome in our institutions. You can check out Kameko’s work at atelier-fuuna.com. You can see what Kameko and her colleagues in education are up to at Newport Art Museum at https://newportartmuseum.org/education/.